In many companies in the Netherlands you build up some money each month and this is paid out in December. Basically this means you get a double salary that month. Most years I am sensible and transfer it to a savings account because we’re saving up to buy a house someday. Not this year. This year, I decided to do my thing against the ongoing global economic crisis and stimulated the Dutch, Swiss and Japanese economies. Oh, who am I kidding? I just wanted some fancy sewing equipment. 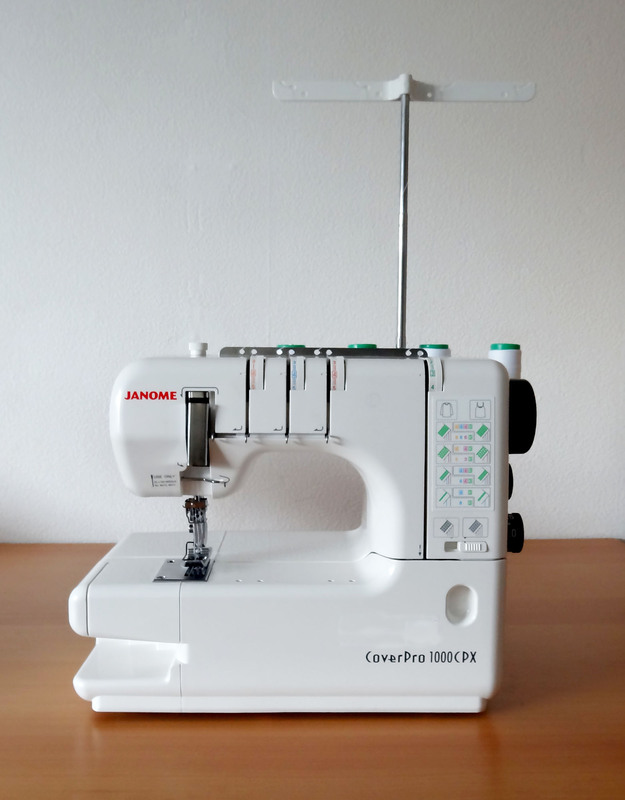 Bernina1110D overlock machine. I see knitwear and quickly finished seams in my future. 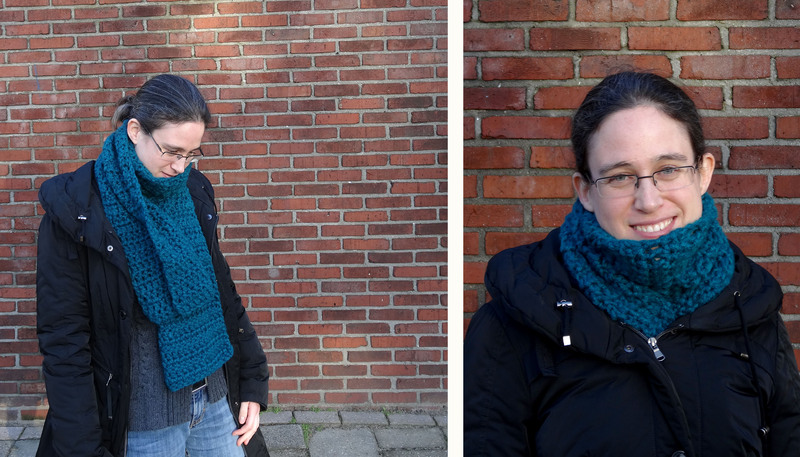 I am super proud of my very first scarf! Is it perfect? No. Is it functional? Very much so. I also completed it in only 2 days so it was pretty fast as well. 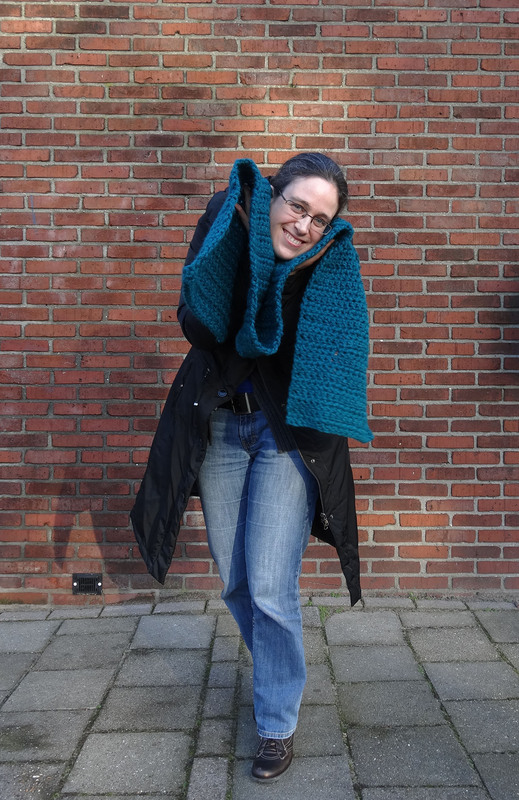 The yarn is Roma Big colour 12 from Scheepjeswol. It’s 100% acryl. 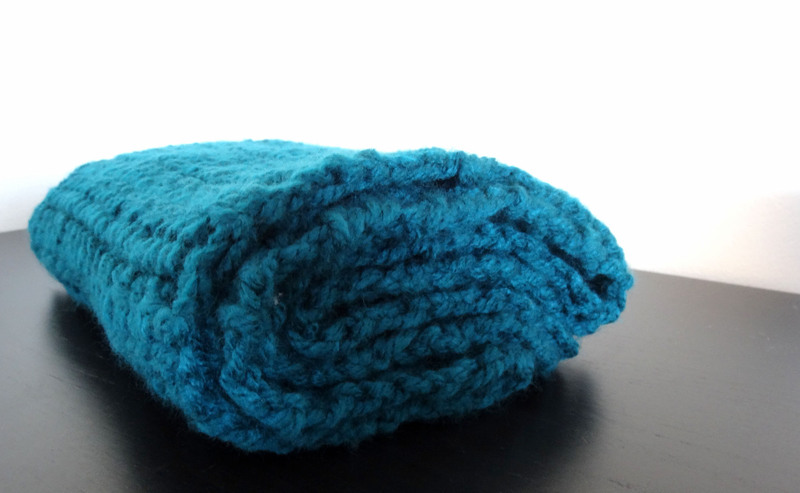 I would have preferred to use a natural fiber but I also wanted to keep my first large project simple and thought it best to use a yarn that doesn’t split easily. This yarn fit that bill and I also really like this colour. The scarf only required two balls of yarn and I used a 10 mm hook (US size N) to make it. At the beginning of the scarf I did 19 double crochet stitches per row and at the end 20. By the time I discovered I had accidently added one stitch too many at some point I would have had to unravel nearly half of what I had already done and figured it wasn’t really all that noticeable so decided to leave it. The scarf is about as long as I am tall, which is 1.65m and it’s going to keep me really warm this winter. A couple of weeks ago I started to learn crochet. What, crochet? And you didn’t like knitting, why would you even try crochet? And do you really need another hobby? Well, I want to have some projects that I can easily take with me on the train. While you can technically take hand-sewing projects on the train I find this a bit too much trouble because you need to bring thread, needles, pins, scissors and a bag to put all the cut off threads in because I don’t want to litter and then I’m constantly worrying that I’m dropping pins all over the place and that someone else will sit in them. A knitting or crochet project requires much less stuff and I think these might work better for travel related crafting. 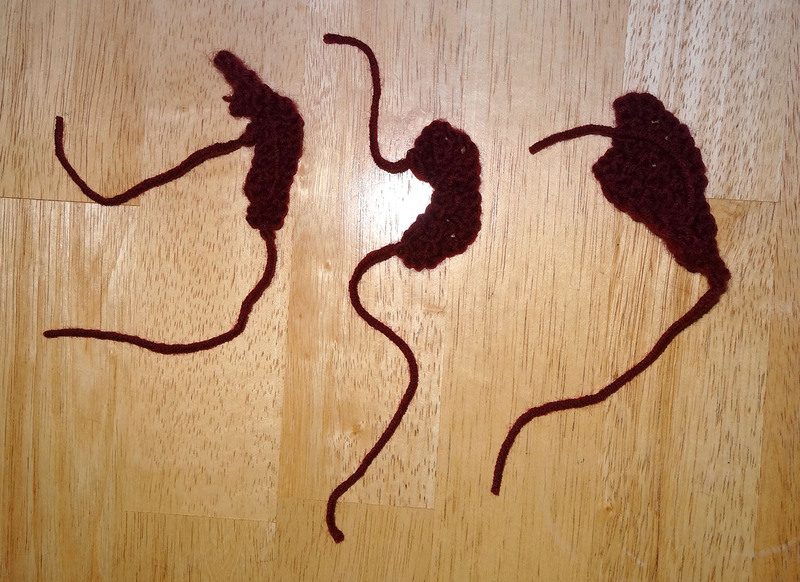 I’ve tried knitting twice and both times this wasn’t very successful so crochet (only 1 hook!) seemed like the better option. The truth is, while fabric and sewing come quite naturally to me, yarn doesn’t. I’ve taken loads of Craftsy courses and for the sewing ones I usually watch the whole course once before starting on a project and then while I’m making the project I’ll watch it again. Tricky parts I might rewatch a third time and then I’ll know what to do. Not with crochet. I’m enrolled in Vicky Howell’s Crochet Lab course and I must have watched the single crochet class at least a dozen times already. It looks like crochet but weren’t you supposed to make a square? It might be somewhat irregular but it approaches squareness. Then I figured I was ready to try double crochet. 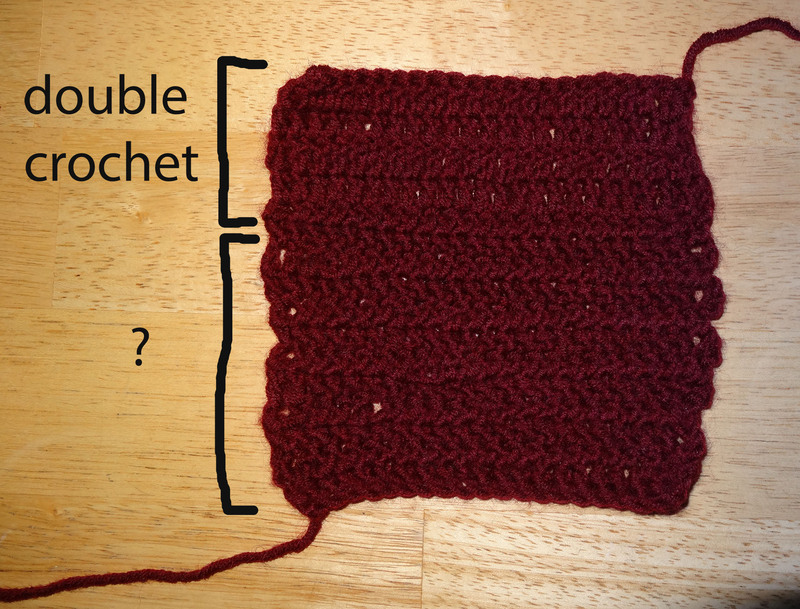 I almost crocheted a whole swatch in what I thought was double crochet but what turned out to be a self-invented stitch. 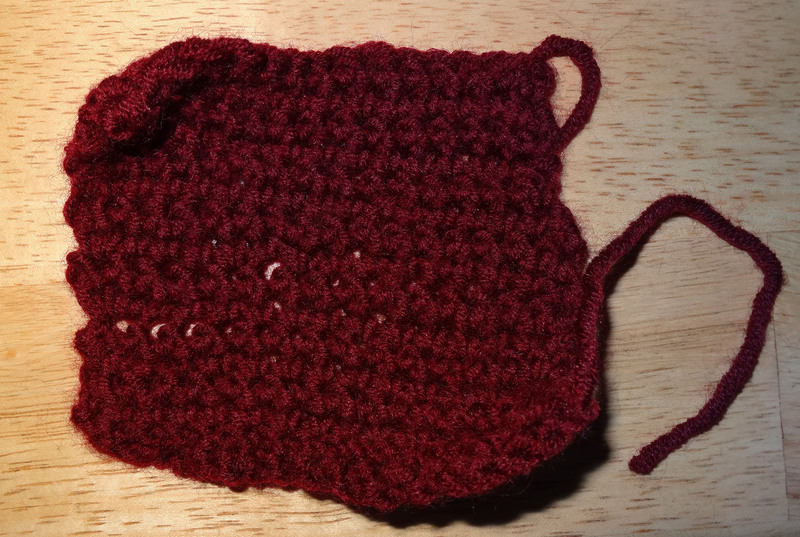 I did wonder why my double crochet was much tighter than the single crochet (it’s supposed to be looser) and didn’t look like what Vicky was doing before I realized that I was skipping a quite essential step. And that was after I had already looked at Vicky doing this stitch a dozen times at least. 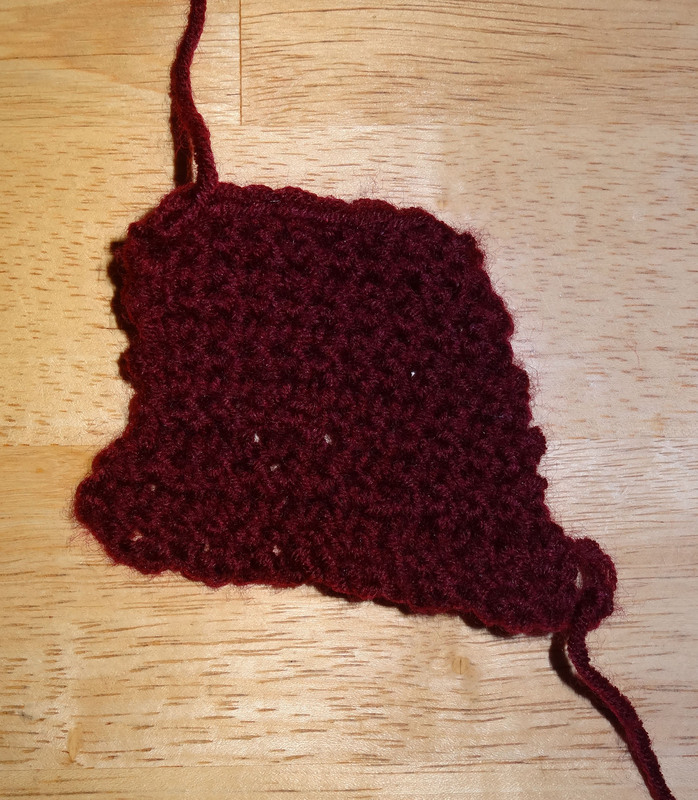 Ah well, after my invented stitch that was quite tricky to do, the real double crochet was a breeze. Now I am ready to tackle a double crochet scarf and for this I clearly need a crochet project bag that I can use to store my project in while travelling. Enter some sewing (after all, this is meant to be a sewing blog!). I made a zipper pouch with boxed corners and three pockets on the inside. One zipper pocket, one pocket that was cut diagonally at the top and is divided into several narrow pockets so that it fits several sizes crochet hooks and one patch pocket on the other side. The outside fabric is interfaced with fusible fleece to give it enough body to stand upright on its own. It fits two really huge balls of yarn and I think it will be very useful to help me stay organised. There are some crochet related things that I find quite strange. For example, it is bad enough that UK and US English uses a different spelling, but why, why, do you use different words to describe the same thing??? And in different conversion charts I also found different terms and abbreviations. I’ve decided to stick to the US crochet terms because that is what is used in the Craftsy class and I don’t want to complicate my life. 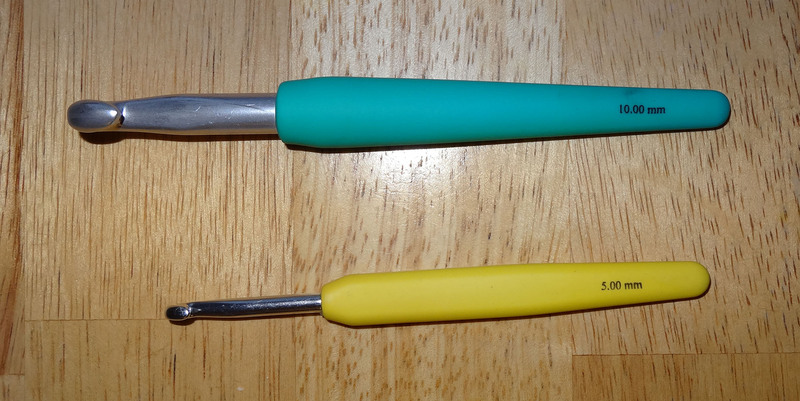 Right now I have 2 crochet hooks from the brand KnitPro, 5 mm and 10 mm. Obviously, the hooks have a different thickness, but why do they also change the size (length and thickness) of the handle? Do they think my hand changes size when I change yarn thickness? As it is, I much prefer to hold the 10 mm hook because it is longer and thicker. The 5 mm really feels too short and my hand gets a bit cramped if I use it for too long. I think I should also try some other brands to find out what works best for me. Does anyone have suggestions? My thinking cap has returned and I managed to finish my Lady Skater dress while busting another UFO in the process. 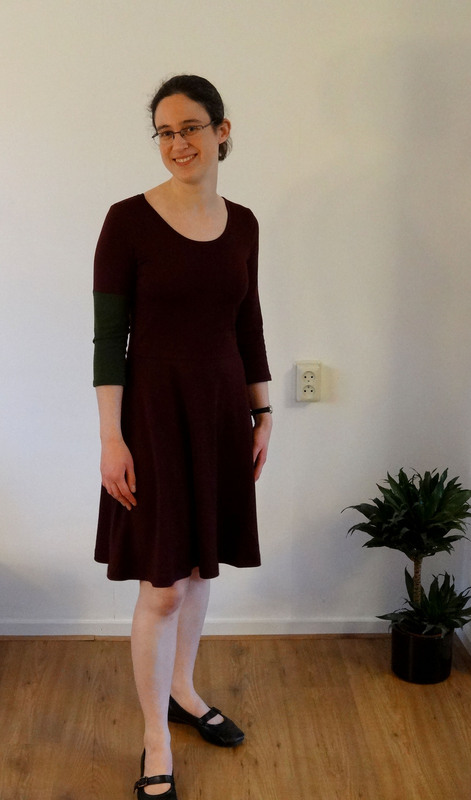 This dress started as Knipmode dress 12 from February 2011. It only needed hems but I wasn’t happy with how it looked. It was too large and the back neck facing refused to lay flat (I’m never going to use this method for finishing a back neckline again, it just doesn’t work with knit fabrics.). I suppose I could have fixed it but I didn’t think the shape of this dress was working for me either so my motivation to get it finished had completely disappeared. I decided to turn it into a Lady Skater dress instead. This would not have been possible if I hadn’t had about 1 meter of fabric left-over. I was able to cut out the back skirt from the back and front skirt of the Knipmode dress, but had to add a centre back seam in the process. The front skirt, front and back bodice and one sleeve were cut from the piece of left-over fabric. That left me 1 sleeve short. There was absolutely no way I could squeeze it out of the fabric in one piece. My options were to either change to short sleeves or piece the sleeve. I think an unnecessary seam in a sleeve isn’t very desirable. It’s bad enough I had to create a centre back seam for the skirt so my solution was to turn it into an asymmetrical colour block dress! I used some olive green single jersey for the bottom part of the right sleeve. I think it adds an interesting touch. Do you like it or do you think it looks as if I didn’t have enough fabric? 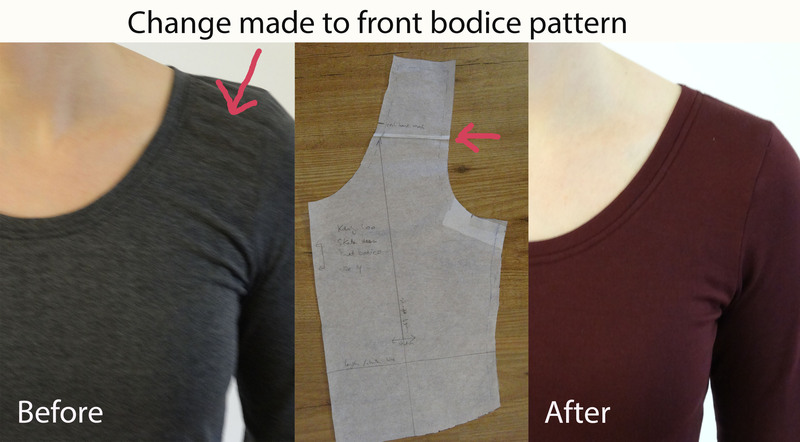 I did make some changes to the pattern pieces before I cut the dress out of fabric to improve the fit even more compared to my previous version and I thought it would be nice to show you what I changed and how that affected the fit. At the top of the front bodice there was a little bit too much fabric that created some wrinkling. I used some pins to pinch this excess fabric out on my test version dress and transferred the amount of fabric that was pinched out to the pattern piece by folding the pattern the same amount. 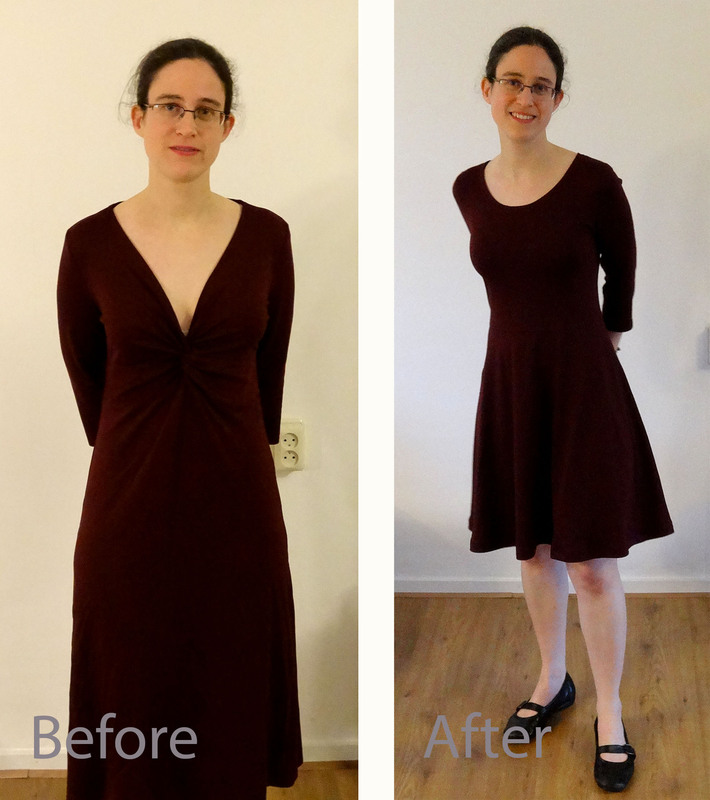 When you look at the before and after picture below you can see that the fabric in my new dress is much smoother in this area. At the top of the back bodice there was also some excess fabric. I solved this the same way as I did the front bodice. (I apologize for not using a picture of the same shoulder.) 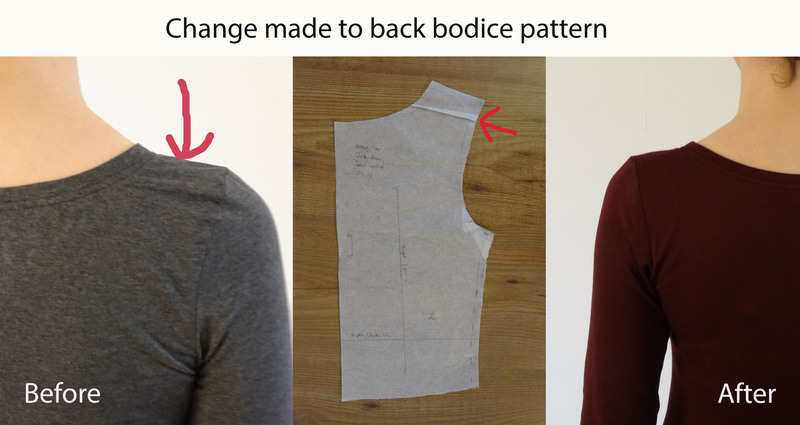 Since the changes I made to the front and back bodice also affected the length of the neckline I also shortened the neckband by the same amount to make sure that it would still fit correctly. In my test version I had already slimmed down my sleeves somewhat and this had improved the fit but there were still a lot of drag lines. I suddenly realised that my arms were much skinnier than what this pattern is made for and that there was simply too much fabric in this sleeve, especially on the front of my arm. Again I used pins to pinch out the excess fabric and transferred this to my pattern piece. Additionally, I slimmed down the sides of sleeves a little bit as well (using a good fitting sleeve from another pattern as a guideline). 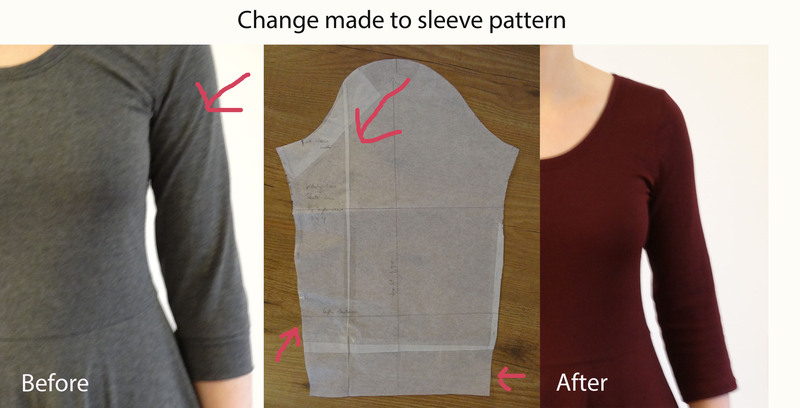 I also made the sleeve pattern longer to get rid of the sleeve band. I am much happier with this dress than I was with the original one and I think I’m going to wear it this Christmas. I still have quite a bit of small pieces of fabric left-over since I didn’t use the original bodice and sleeves for my new dress. Perhaps I’ll be able to turn those into a baby top to get this UFO busted even more. 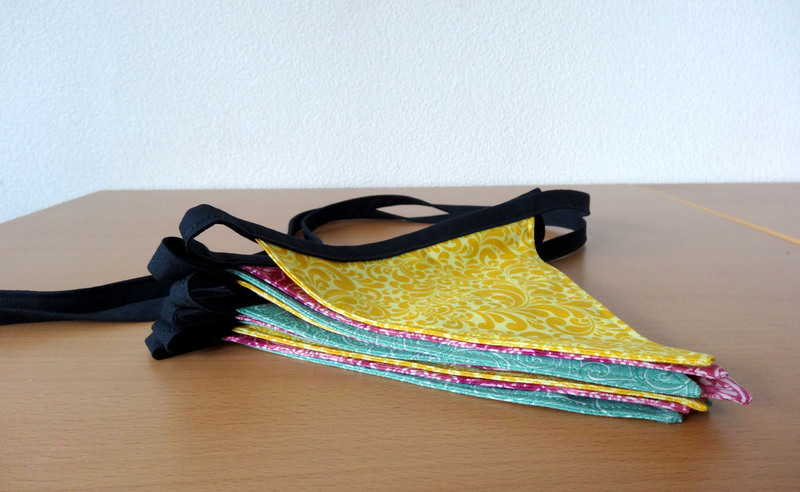 I’m still too tired to tackle complicated projects so I made something I said I’d make months ago: bunting for our office. We decorate the desks of people that have their birthday but the decorations that we have are old, worn and tacky. Some of it is only held together by adhesive tape. 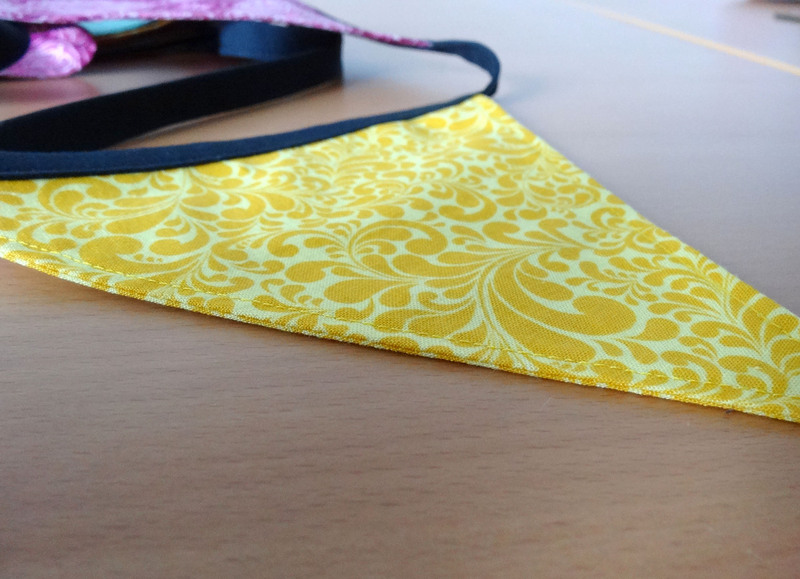 One day, (much) earlier this year, a colleague and I were hanging up all the stuff and discussed that it would be nice to get some new decorations and I figured I could easily make some fabric bunting that would look loads better than the plastic bunting we’re currently using. Of course, I never got around to actually making any until this weekend. I used 3 fat quarters for the flags and some Kona Pepper for the bias tape. Here I got the idea to use iron on hemming tape to attach the flags to their ribbon instead of pins. 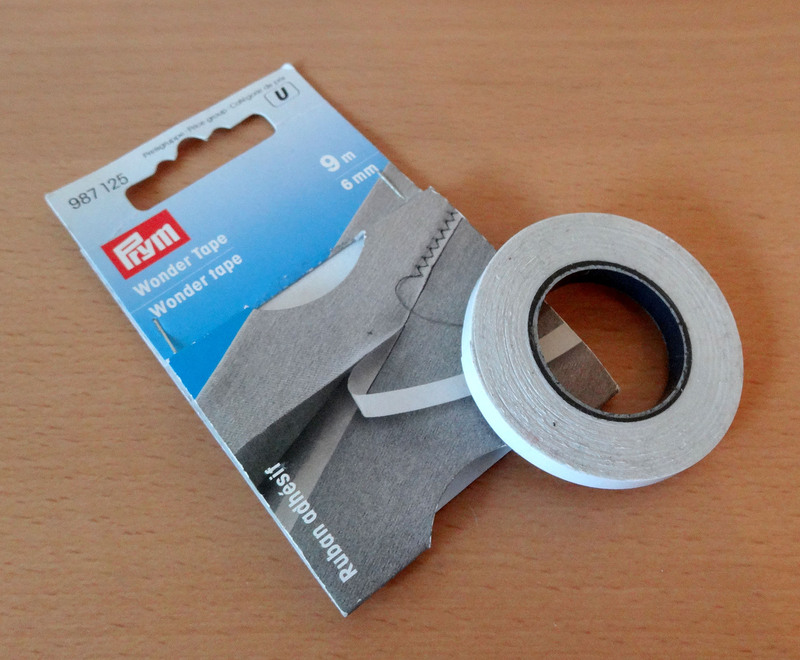 I can’t believe I didn’t think of this myself and while I don’t have iron on hemming tape, I do have Prym Wonder Tape. This stuff is amazing. It is double sided adhesive tape that you can sew through. I usually use it for installing zippers so I don’t need to struggle with pins. For the bunting I used it to stick my flags in between the folded bias tape and this worked like a charm. The tape doesn’t stick so much that you can’t reposition it but it is sticky enough to be used instead of pins. Now, I really want to continue with my next Lady Skater and while this dress is easy to sew I’m still in the process of improving the fit even more and for that I do need my thinking cap on. Hopefully I’ll get it finished by next weekend. I want to wear this dress and cross another UFO from my list. What do you do when you are tired? Do you stubbornly continue with the project you’re working on even if the next step is to tackle that welt pocket that you’ve never made before? 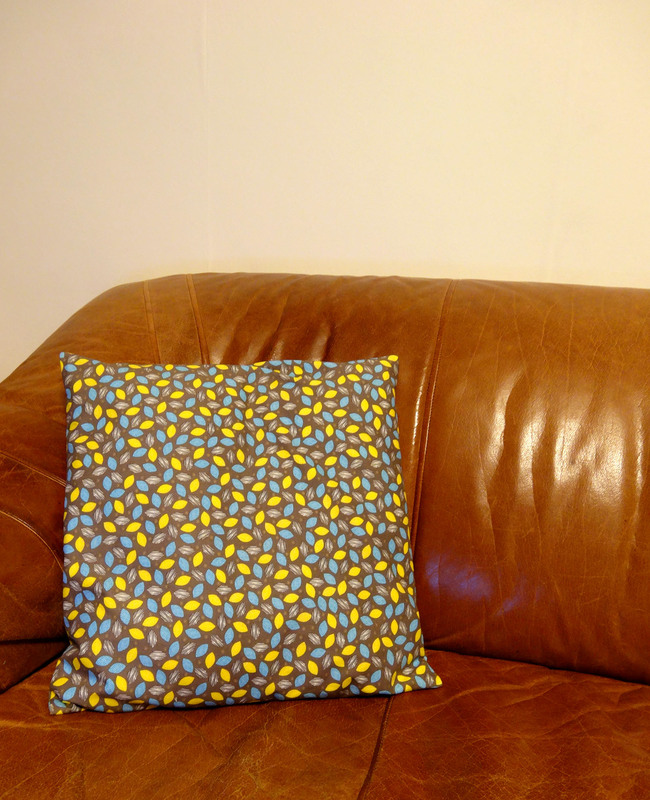 Do you, like me, switch to something easy or do you simply not do any sewing? I really wanted to do some sewing today but was very tired and sewing when tired isn’t always a particular good idea. When I am in this state I shouldn’t attempt anything complicated because I am sort of guaranteed to mess something up. I decided to try a simple idea I had a while ago for an easy lined pillow with envelope closure. I prefer to line pillow cases, especially when using a thin fabric like a quilting cotton. It gives the pillow case a bit more body and I think a pillow looks better with a lined pillow case. I am very happy with the result of this experiment so I turned it into a tutorial. The envelope closure is the easiest pillow closure to make. I suppose my lined version is slightly more complicated than what people usually do when they make these pillow cases but I still think this method is suitable for beginner sewers. 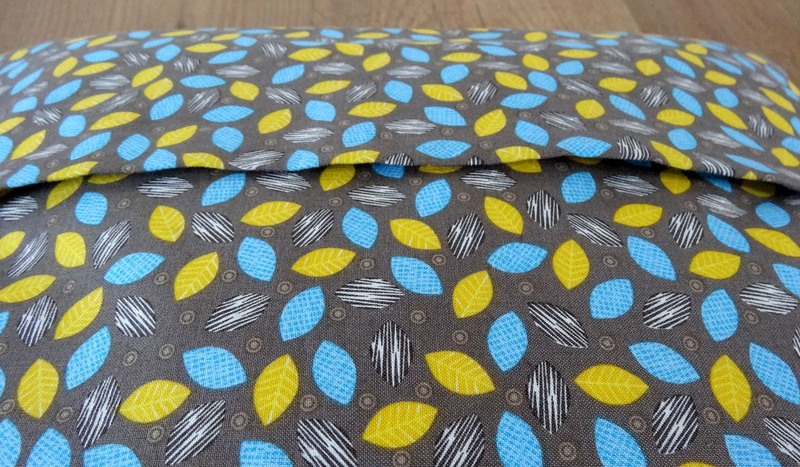 For this lined pillow case you only need to sew 4 seams and only 2 fabric edges require a seam finish, that doesn’t sound too complicated, right? For the fashion fabric of my pillow I used a quilting cotton, Safari by Angela Rakucki for Anthology Fabrics, and the lining is white Kona Cotton. I recommend that you prewash both fabrics to make sure that your lining doesn’t shrink less or more than the fashion fabric when you wash the pillow case. Step 1: Use the formulas shown below to calculate how much fashion fabric and lining fabric you need to cut. 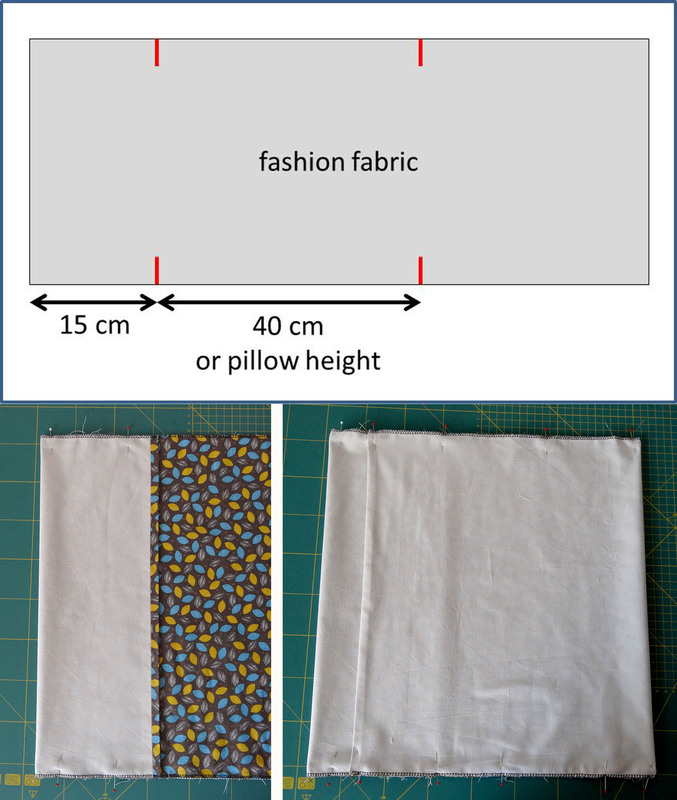 I used metric measurements today and I made a pillow case for a 40×40 cm (16’’x16’’) pillow. Step 2: Cut fashion fabric and lining fabric according to your measurements from step 1. I always use a cutting mat, rotary cutter and a quilting ruler because I find this much more accurate than scissors. Step 3: Place the fashion fabric and lining right sides together and pin the short edges. The lining is shorter than the fashion fabric but this will be solved later on. Step 4: Sew both short edges with a 1 cm (3/8’’) seam allowance and press the seams open. Step 5: Turn the fabrics right sides out and on one short edge press the seam as shown in the picture below. Step 6: Now we are ready to solve the issue of the lining being shorter than the fashion fabric. On the short edge that isn’t yet pressed a small strip of the fashion fabric will be pressed towards the lining side (see picture below). The easiest way to do this is to start at the short edge that is already pressed and to use your hands to smooth the lining and fashion fabric so that any wrinkles disappear. Work your way up towards the unpressed edge and use some pins to secure the long edges as you go. When you reach the end about 1 cm (3/8”) of the fashion fabric will want to be on the lining side. First use your fingers to create a small crease and then press the fold with your iron. Step 7: Pin both long sides and finish the edges with a zig zag stitch or overlock stitch. Step 8: Place the pillow case with the fashion fabric side upwards. Step 9: Measure 15 cm (6”) down from the short edge that has the fashion fabric pressed towards the lining. Make a mark on both long edges. From these marks, measure 40 cm (16”) down (pillow height, if you’re making a different size pillow) and make another mark on both sides. Step 10: First fold back the short edge that has the fashion fabric continue into the lining on the first mark and pin in place. Step 11: Fold back the other short edge on the second mark so that it overlaps the other folded back edge and pin in place. Step 12: Sew along the long sides with a 1 cm (3/8”) seam allowance and press the seams. Step 13: Turn pillow case right side out, stuff with a pillow form and put on your couch. Do you notice how presssing a small amount of the fashion fabric to the lining side ensured that you can’t see the lining from the outside of the pillow? If the corners of your pillow are very bulky you can trim them down somewhat but I didn’t find this necessary. Can you tell I used a white lining? I hope you enjoyed this tutorial and if you make any lined envelope pillows I’d love to see them! In October I sadly had to say goodbye to my old iron. It had been a constant companion during my sewing journey and suddenly it failed to heat up. As it turned out, the cord had become damaged, exposing some of the electric wires. Even if it had still wanted to heat up it had become dangerous to turn it on. I can’t sew without an iron (well, I suppose I could, but I don’t want to! ), because pressing is essential when you want to create professional looking items. I had to make sure I got a new one fast. My first and almost immediate solution was to borrow my sister’s iron because she doesn’t use hers all that much. The next step was to do some research to see which one I’d like to get. What I found really difficult about buying a new iron is that you can’t test them in a store. I haven’t used a lot of different irons in my life so that also makes it quite difficult to know what the differences between the various brands and models are. You simply have to depend on the information provided by the manufacturer and online reviews. Eventually I decided on the Philips EcoCare GC3760. It fit all of my requirements. 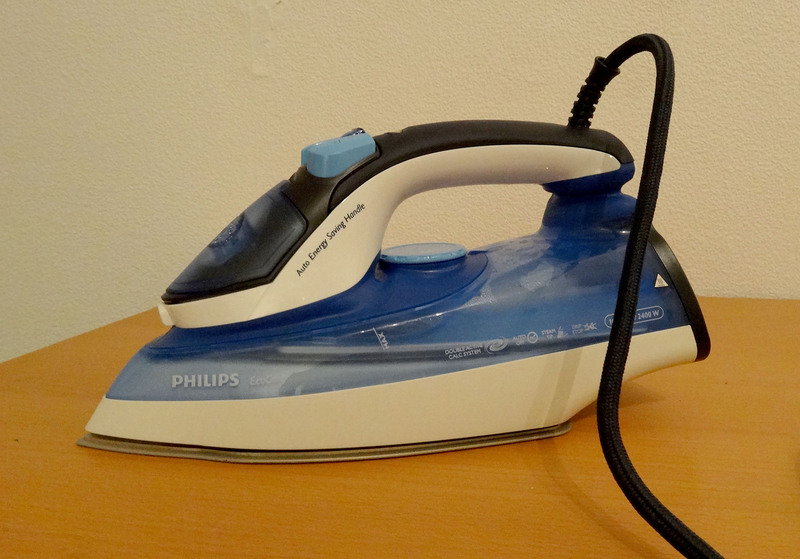 My previous iron was a Philips Azur40 and it lasted more than 15 years (it used to be my parents’ iron before I got it) and I liked it a lot. 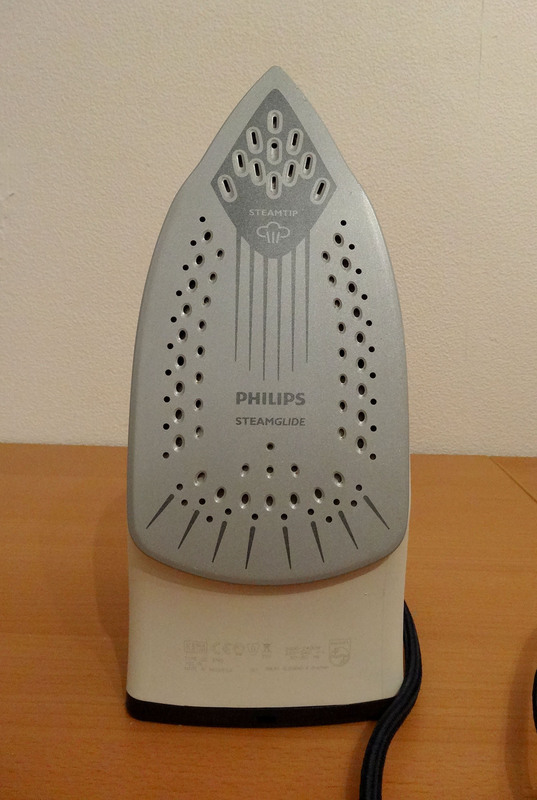 The iron I borrowed from my sister was a Philips EnergyCare (don’t remember which model, but I tried to look for it during my research and you can’t buy it anymore) and I enjoyed using hers. Her iron was definitely an improvement from my old one, which I already thought was pretty good. The GC3760 appeared to be quite similar to hers so it seemed a safe bet. So, how do I like my new iron you might wonder? It is definitely much more powerful than my old one. It can produce massive amounts of steam and sometimes it makes my glasses fog over when I get too close. That never happened before. I get wrinkles out a lot faster now. I think it heats up pretty fast, so when it automatically shuts off because I haven’t used it in a while I don’t have to wait long before I can press my seam. I am a huge fan of the auto shut-off. 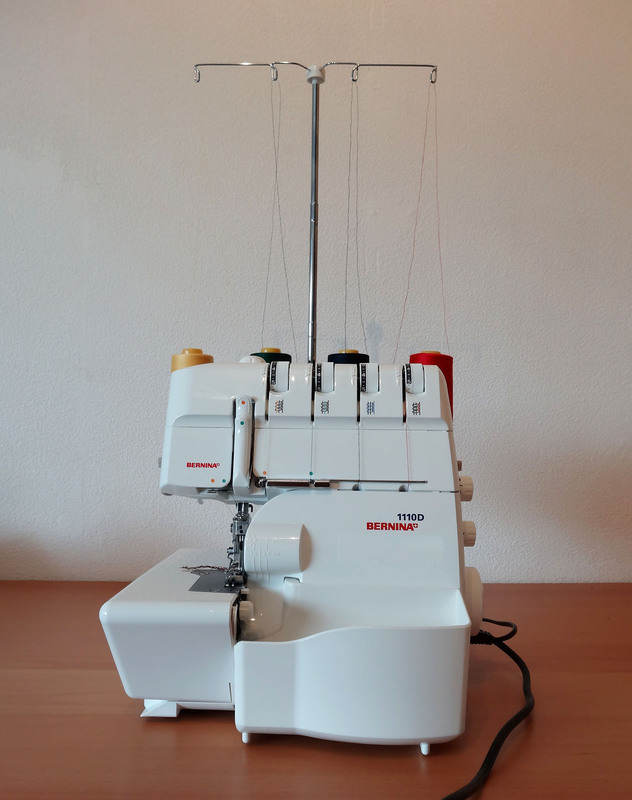 I am always worried that I forget to turn off my iron when I am finished sewing or have to run downstairs because I hear the telephone ringing and now I have an extra safety precaution (I still make sure to switch it off though). I also like the soleplate, it is very smooth. The drip prevention doesn’t work 100%, I have had some drippage. It wasn’t a lot though and it certainly doesn’t happen as often as with my old iron. I do run out of water sooner than with my old iron but considering how much more steam it creates compared to the old one this isn’t all that surprising. When I am pressing a very large piece, for example some pre-washed yardage, it sometimes stops producing steam and won’t produce more until I put it upright for a little while. I’m not really sure why this happens (it has to recover?) but it only happens occassionally so I don’t mind too much. The first couple of times that I used it the iron made a lot of noise when I put it upright but that has disappeared. Overall I am happy with my decision and hope this iron will last as long as my old one. Which iron do you have and do you like it? 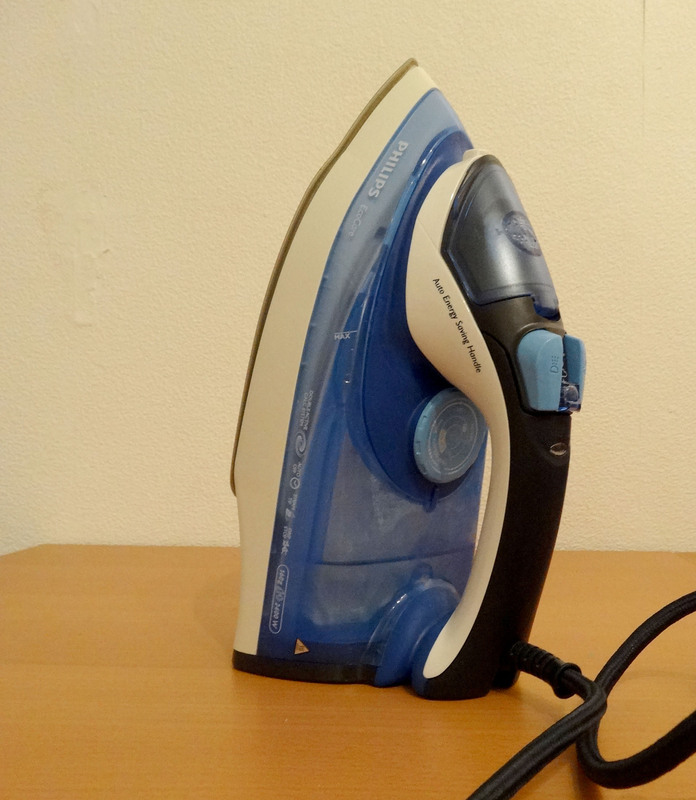 Does your iron have features that I didn’t mention in my list but that you really like?